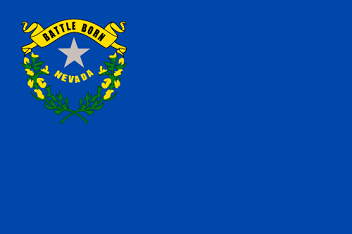 The State Flag of Nevada features a plain cobalt blue field (background). In the canton area it bears the motto "Battle Born" above a single 5 pointed silver star, cradled by a wreath of sagebrush (the state flower), over the the name of Nevada. The Nevada flag serves as a symbol of honor, heritage and regional pride and is displayed at state buildings. There is a strict Order of Precedence for flags. State Flags are displayed in order as they entered the Union. Car Flags are often displayed to represent of an individual's allegiance to their state. Nevada State car flags are used by their owners as mobile emblems of their home. Car flags are usually made from strong materials and are attached to a car via a pole and clip window attachment. What is the design of the Nevada state flag? The design is a cobalt blue field on which the canton section contains two sagebrush branches encircling a silver star with the text "Nevada" and "Battle Born". What does the sagebrush symbolize? What does the star symbolize? According to the ancient laws of heraldry a star symbolizes honor, achievement and hope. What does the banner "Battle Born" refer to? What are the colors and what do the colors mean, or symbolize, in heraldry? What is the shape and flag ratio? The 'Hoist' is the width and the 'Fly' is the length. The ratio is 2:3 meaning it is 2 units tall for every 3 units wide. Who designed the Nevada State Flag? What is the history of the Nevada State Flag? 1915: The design was changed to feature the Coat of Arms and the motto the words "All For Our Country" instead of reflecting the silver and gold resources. 1926: Due to high manufacturing costs of the 1915 design, a contest was held in 1926 to find a new design. Louis Schellbach, III won the contest. His design specified that the word "Nevada" should circle the points of the star. However, the name continued to be placed around the star in error for more than 60 years! 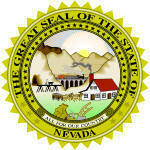 The Nevada flag is kept and used as required by the code specified in the constitution of the state.